Psalm 127 is yet another one of many song of ascents, but it is unique in that it’s written by Solomon. Perhaps this psalm is rather characteristic of Solomon in tone and content, as it speaks about how men’s possessions are all given by God. Solomon points out the authority of God, and the first verse in this psalm would perhaps sound like it’s taken straight from the book of Ecclesiastes. The idea of men’s labour is in vain is very prominently elaborated upon in Ecclesiastes 2:17-26. 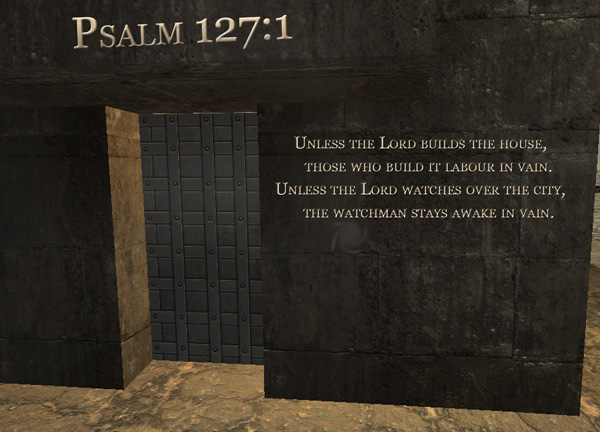 This verse shares a similar theme, and today’s study will be focused on the futility of labour without God. Unless the Lord builds the house – What does it mean to have the Lord build your house? We can take it literally – the foundations of the house, the basis of the house, rooted in the word of God, filled with the presence of the Holy Spirit. It could be your house, my house, Solomon’s house; perhaps in modern context – the means or the money that you use to build the house? Is it money earned in integrity? Perhaps it refers to the house of the Lord – a church, with a façade of a church and a foundation not based on the word of God, with ulterior motives and hypocritical messages. There are only two kinds of houses here. Not good houses or bad houses. Not pretty ones nor ugly ones. Not big ones or small ones. Just houses built by the Lord, and those not. those who build it labour in vain – this basically means that, it’s a wasted effort, isn’t it? Meaningless effort. Oh, sure, you get a great, fancy house. It’s worth millions. You can hold multiple parties in it. You are showered with praise and envy because of it. Your status and fame solidifies thanks to it. A house proves a lot – but in front of God, it is meaningless. It counts for nothing, if it was not built by the Lord. If the blessings of God isn’t upon it, your labour is in vain – not in the sights of Men, but that there will be absolutely no eternal value. Same goes, with ‘the house of the Lord’. We may labour and sacrifice a lot for a good church, a large congregation, but if it was not built up by the Lord himself, it counts for nothing. the watchman stays awake in vain – much like the previous line, the roles of the watchman are to watch the city, but it is a wasted effort. There is no meaning in it. There is also no peace in doing it. Have you stood guard over something before? The general idea is, you are armed, you stay alert all through the night, when everybody else is sleeping. You cannot leave your position, for it is often when the watchman leaves his position (or dozes off) that the enemy strikes. It is not an easy job. It is incredibly boring, but yet incredibly important. There is a spiritual connotation here – in terms of the Old Testament, the prophets were also known as watchmen [Isa 21:11]. They were watchmen of good, watching over the souls of men, watching over themselves, guarding against the evil and the ungodly acts, practices and behaviours. But, even if there are many watchmen, even if they are diligent to their duty and performs it with excellence, not sleeping a wink as they stand alert, it is futile, unless God himself watches over the city. Unless the Lord watches over the city – If God himself isn’t the wall around the city, if God’s protection and peace has not been given to the city, then, even if there are watchmen, even if the city is well defended, it will still fall, wouldn’t it? He who watches over Israel will neither slumber nor sleep [Psa 121:4]. Whatever we do, if the Lord is not with us, if the Lord is not doing it with us, Solomon says, it is then meaningless. Wherever we go, if the Lord goes not with us, it is then meaningless. What good will it be for someone to gain the whole world, yet forfeit their soul [Matt 16:26]? Especially when we look at the timeframe of eternity, the achievements that we obtain in life through our labour becomes minuscule and insignificant. Should we not labour then? Certainly not, that’s not Solomon’s point. But if we solely focus on labouring, and miss what is truly eternal and previous, then our labour will be for naught.